-This was a fun filled weekend. There was garage sale galore where I found, among other things, two stools for the Mancave for a dollar each. But most importantly, my littlest Sun Kissed Boy turned 3!! 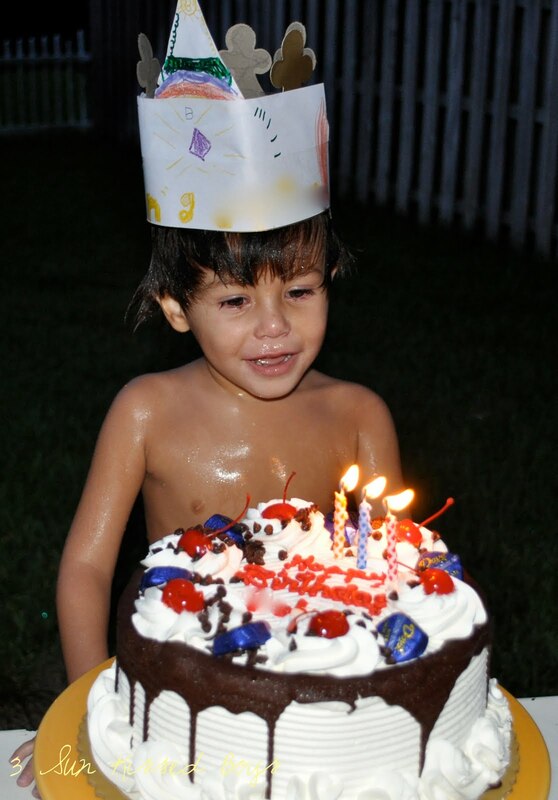 His day was filled with pool fun until the late hours of the night, cake, presents, and balloons. What else could a 3-year-old ask for?! 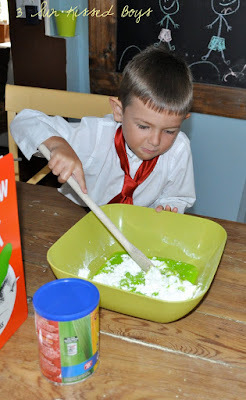 We also made Oobleck! My sister-in-law, Melissa, is studying to be a teacher. 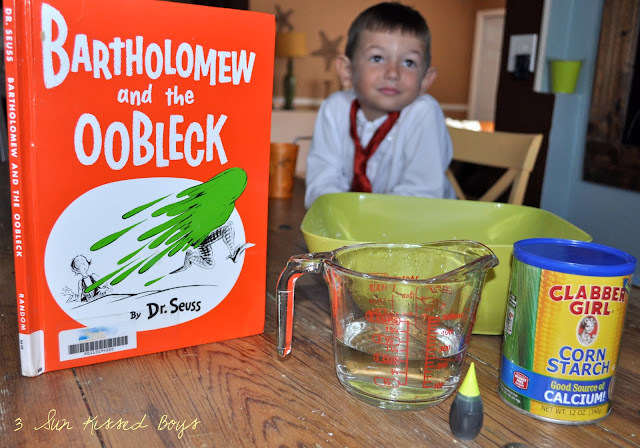 One of the things she recently discussed in class was the book Bartholomew and the Oobleck by Dr. Suess. It’s a story about a boy that saves the kingdom by encouraging the king to say the magic words. She started out by reading the boys the story. 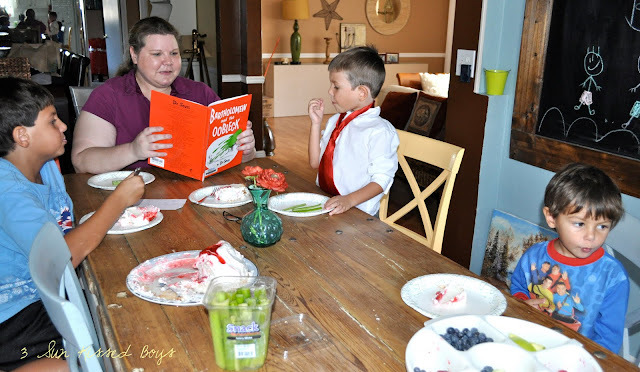 The story can get a little lengthy for the little ones but snacks always slows them down. 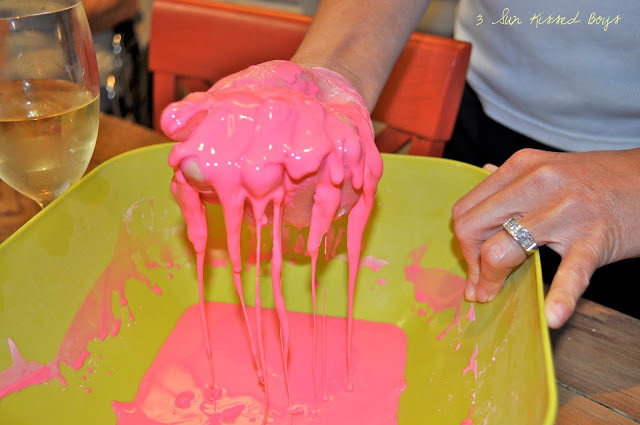 Here’s what you need to make the oobleck. It’s a good idea to mix the food coloring in the water before pouring it in the corn starch to avoid your hands from turning green. Unless that’s what you want. Now that I think about it, I’m sure my boys would have gotten a kick out of having green hands. Mix it up then dig in! The cool thing about this is that it looks like a liquid but it feels like a solid. I wanted to join in the fun. When the kids were done, Melissa and I couldn’t stop playing with it. 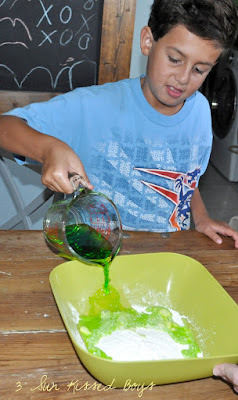 We also figured out that if you let it sit a little, the mixture becomes thicker and easier to handle. We had tons of fun with it so we made another batch (this time pink) and asked the girls next door (our neighbors) to come and join. 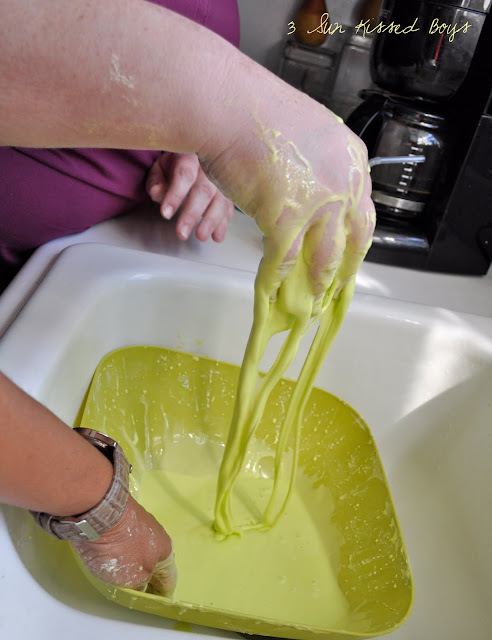 It was really hard to capture the oobleck in solid form in pictures so I took a video of it. In another random note, here are my I’m-hanging-on-to-summer toes. Did you see Ellen the other day when they had an audience member WALK across a huge vat of water and cornstarch? Amazing. 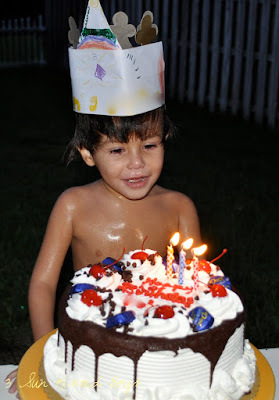 That cake looks AMAZING - Happy Birthday little dude :D The gunk look gunkie - but fun. We may have to give it a whirl :D Oh, and cute summer toes. GOD BLESS YOU FOREVER AND BE HAPPY ALWAYS MY DEAREST.. LOVE YOU!!!!!!!!!! Hm, me thinks my first graders would love something like this this year. The question is: could I handle the mess? 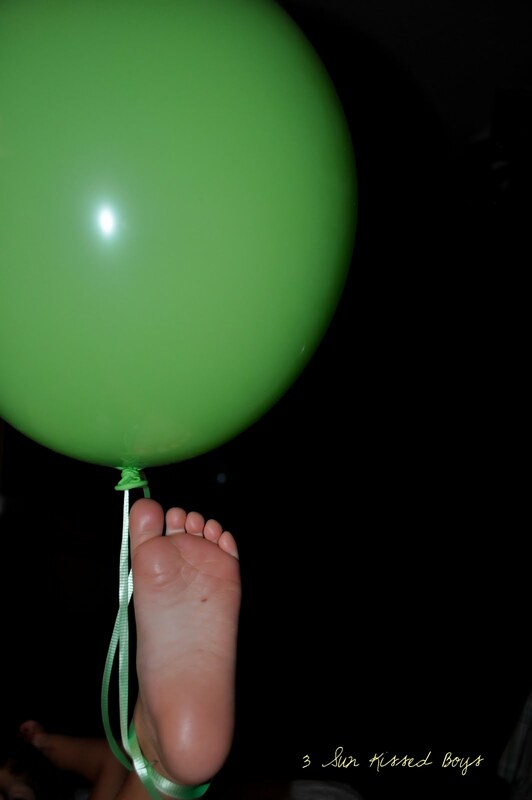 my daughter used to love playing with that stuff ... so much fun ... i love your summer toes, very cute! This sounds like the perfect party idea for boy. I would loved to have my hand squish in it too. Your kids are soooo cute! Love the toes also. I am dreading winter here and trying my best to hold on to summer. Will it really help if I paint my toes green? Won't hurt to try..
Great post & blog - & many thanks for stopping by! I LOVED the story Bartholomew and the Oobleck when I was young. For some reason, it really captured my imagination. So much fun! He's a mighty fine looking three-year-old. I think my favorite though is the festive toes! I'm a fan of all of DR. Seus' work. I can only imagine how much fun this was for your boys! I always made green eggs with my first grade class. 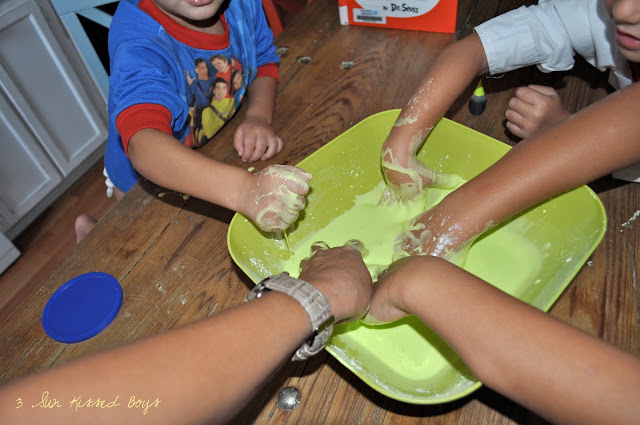 I loooove making oobleck! Isn't it the strangest yet coolest thing?! Oh, happy birthday to your little sweetie. He is so adorable! And so are you toes! I think my Grands would love playing with that stuff. And we haven't read that book in forever. Yanet, thanks for such a fun link! I think you've definitely inspired a lot of us.